Browse: Home / AIEngine v1.7 (Artificial Inteligent Engine). 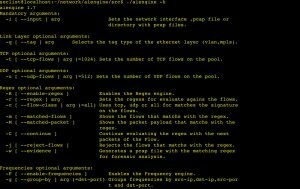 AIEngine is a next generation interactive/programmable Python/Ruby/Java/Lua packet inspection engine with capabilities of learning without any human intervention, NIDS(Network Intrusion Detection System) functionality, DNS domain classification, network collector, network forensics and many others. * Support for interacting/programing with the user while the engine is running. * Support for PCRE JIT for regex matching. * Support for regex graphs (complex detection patterns). * Support five types of NetworkStacks (lan,mobile,lan6,virtual and oflow). * Support Sets and Bloom filters for IP searches. * Supports x86_64, ARM and MIPS architecture over operating systems such as Linux, FreeBSD and MacOS. * Support for HTTP,DNS and SSL Domains matching. * Support for banned domains and hosts for HTTP, DNS, SMTP and SSL. * Frequency analysis for unknown traffic and auto-regex generation. * Generation of Yara signatures. * Easy integration with databases (MySQL, Redis, Cassandra, Hadoop, etc…) for data correlation. * Easy integration with other packet engines (Netfilter). * Support memory clean caches for refresh stored memory information. * Support for detect DDoS at network/application layer. * Support for rejecting TCP/UDP connections. * Support for network forensics on real time. * Supports protocols such as Bitcoin,CoAP,DHCP,DNS,GPRS,GRE,HTTP,ICMPv4/ICMPv6,IMAP,IPv4/v6,Modbus, MPLS,MQTT,Netbios,NTP,OpenFlow,POP,Quic,RTP,SIP,SMTP,SSDP,SSL,TCP,UDP,VLAN,VXLAN. –enable-tcpqos enable TCP QoS Metrics support for measure the QoS of connections. –enable-bloomfilter enable bloom filter support for IP lookups. This option should have the correct libraries. –enable-fscompress enable flow serialization compression support for minimize the amount of data write when using DatabaseAdaptors on the library. –enable-reject enable TCP/UDP reject connection support for break establish connections on StackLans and StackLanIPv6 objects. –enable-pythongil enable Python Gil support for multithreading applications. –enable-staticmemory enable static/fixed memory support for systems with low memory requirements (256 Bytes slot). –disable-releaseflows disable release flow support, for make static analisys of network flows, for pcap file analysis. 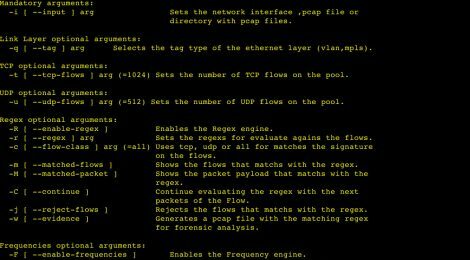 ← Dissembling Ferret – Exploiting covert channels in the TCP/IP protocol suite.